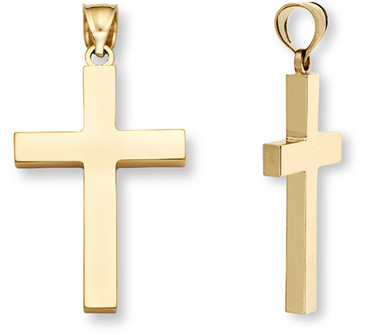 High polished 18k solid yellow gold cross pendant is simple and elegant. This cross pendant isn't complicated, but it communicates a powerful message with strength and timeless class. This gleaming, simply-styled cross is crafted from solid 18K yellow gold not gold plated or hollow making it a piece of fine jewelry that will represent your faith for a lifetime. At an inch high and just under 3/4-inch wide, this piece is big enough to be noticed, but small enough to allow its message rather than its size to take the spotlight. Also available in 14k yellow gold, 14k white gold, or platinum - as well as larger version (shown below). Optional: Add an 18k solid gold box chain in either 18" or 20". Chain measures 1mm thick. We guarantee our 18K Gold Plain Cross Pendant to be high quality, authentic jewelry, as described above.